SiTCP Library | Bee Beans Technologies Co.,Ltd. SiTCP is the technology that connects a FPGA with the network. Using SiTCP, You easily construct a server used in scientific experiment, on which you need transfer of large-capacity data. It can transfer data by 1Gbps without data communication software. 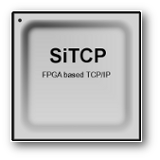 SiTCP is a library file to use in a FPGA on your module. We distribute and manage the library which has been offerd by Dr. Tomohisa Uchida of KEK. Provide library files in binary mode for each Xilinx FPGA that cover most products. See following documents for farther details. You can download the library file from SiTCP User Community or GitHub (How to download). We sell license files (MPC file) with MAC address. Please apply for quotation from here. To download documents and software about the product, please see Support Page. We acquired certification under the quality management system ISO 9001: 2015 and the information security management system JIS Q 27001: 2014 (ISO / IEC 27001: 2013). © 2015 Bee Beans Technologies Co.,Ltd.